Residents across the borough planning a street party to celebrate the Royal wedding in May need to contact Sefton Council. Party organisers are being asked to get in touch with Sefton Council in relation to any possible street closures on Saturday, May 19 for the wedding of Prince Harry and Meghan Markle. Sefton is keen that as many people as possible enjoy the special occasion, but any road closures must be formally advertised in the local press. Residents planning a party have until Friday, April 20 to notify the Council which will enable all the road closures to be legally advertised in one advert. Cllr John Fairclough, Sefton Council’s Cabinet Member Locality Services, said: “Already we have been contacted about a couple of road closures for street parties celebrating the Royal wedding and if you are thinking of this, please get in touch. “Organising a street party has many different rewards and brings together neighbours and local communities. “Anyone who is planning such an event should contact us as soon as possible so that we have details on what they are planning for the day. To apply for a temporary road closure either call 0345 140 0845, email colin.taylor@sefton.gov.uk or apply in writing to Colin Taylor at Highway Safety, Magdalen House, 30 Trinity Road, Bootle, L20 3NJ. Residents will need to provide the organiser’s name and address and contact details, the date they plan to hold the party and the road or section of road they wish to close. Officers will assess the location of the road closure before responding directly to each applicant and there will not be a charge for the legal procedures for the road closure. For further information about events taking place in Sefton, please visit www.sefton.gov.uk. West of Victoria Road lies a not-so-hidden gem in Formby’s historic and beautiful National Trust pine woods and beaches. The glorious sandy beaches of Formby are perfect for family picnics, coastal walks, dog walking, wave jumping, kite flying or just lazy days at the beach. Prehistoric footprints have been uncovered in silt beds exposed by the moving sand. The woodlands at Formby are home to a population of red squirrels, making it one of the few places in the UK where you can catch a glimpse of these shy creatures. Covered with marram grass and home to a number of rare and protected species, the ever-shifting sand dunes are also one of Formby’s fantastic features and are a popular tourist trap during the hotter Summer weather. 2018 marks 51 years since the National Trust first set up in Formby. While celebrating half a century in the borough, superb partnership working has also enabled Sefton to successfully transfer further land at Formby Point to the National Trust. Watch this space as National Trust look to develop this site even further for the benefit of us all. More than £20m of business was generated for the Sefton economy by hosting The 146th Open at Royal Birkdale last year. Businesses the length and breadth of the borough benefited from staging the Championship which brought record crowds to Southport and the surrounding area in 2017. An independent report from the Sport Industry Research Centre at Sheffield Hallam University estimates the event delivered at least £20.9m of business for local hotels, shops, restaurants, bars and transport providers. The wider Liverpool City Region, including Sefton, is estimated to have received a business boost worth at least £35.2m. Off-course spending by spectators is the largest proportion of the money spent locally, with goods and services bought in the area by players, sponsors, media and event organisers included in the calculation. The Open at Royal Birkdale, from 16-23 July 2017, attracted 235,000 spectators, a record crowd for the Championship in England. 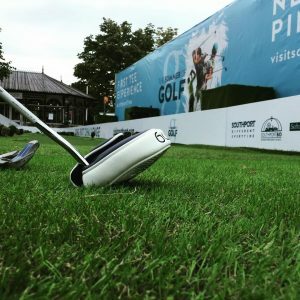 In a further boost to the tourism economy, an independent monitor of global television coverage of The Open captured graphic, scenic and verbal references to Royal Birkdale, Southport, England’s Golf Coast and the Sefton Coast totalling 707 hours and worth £50.9m in advertising terms. “The Open was an outstanding success for business locally and will stay long in the memory for some 10,000 local residents who took the opportunity to experience a global sports event on their doorstep. “The figures quoted in this study are pretty spectacular and reinforce the fact that we can host amazing sporting events that showcase the borough right across the globe. “The Open is a firm favourite with sports fans in the North West with Royal Liverpool in 2014 and Royal Birkdale in 2017 attracting 465,000 spectators between them. The Open at Royal Birkdale economic impact analysis, conducted by the Sport Industry Research Centre at Sheffield Hallam University, included 2,094 face-to-face spectator interviews and is consistent with UK Sport’s gold standard approach to economic impact studies EventIMPACTS.com. The 147th Open will be played at Carnoustie in Scotland from 15-22 July 2018. A 23-year-old woman has been fined a total of £860.55 for dumping a wooden crate full of waste in Bootle. Hannah Williams, of Lathom Road, Bootle was found guilty in her absence at South Sefton Magistrates Court on March 13 of leaving the household waste in Claremont Close, Bootle in August last year. Magistrates fined Williams £500 with £310.55 in costs and a £50 victim surcharge. In separate hearings on March 13 at South Sefton Magistrates Court, three dog owners were fined for failing to get their pets micro-chipped. Stephanie Lewin, 28, of Lytham Road, Southport was found guilty in her absence and fined a total of £222. Paul Carney, 29, of Galsworthy Walk, Bootle was also fined £222 in his absence. Claire Garner, of Worcester Road, Bootle appeared before Magistrates and was fined a total of £100. Littering cases were also heard on March 13, with four people being fined over £900 for not keeping Sefton clean, green and beautiful. Chris Graham, 60, of Hayes Lane, Altrincham was found guilty in absence and fined a total of £322. Lauren Gill, 31, of Mount Pleasant, Waterloo entered a guilty plea by post and was fined £260. John Perry Forsyth, 58, of Merrilocks Road, Blundellsands was found guilty in absence and fined a total of £322. A spokesman for Sefton Council said: “We welcome the outcome of these cases.